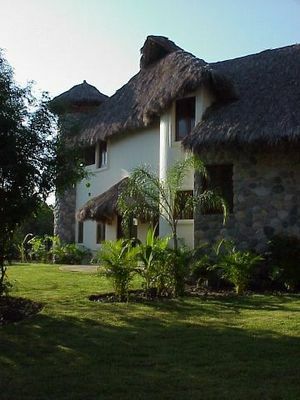 Casa Aguas Vivas is situated 20 minutes north of Puerto Vallarta's Diaz Ordaz Airport along Nayarit, Mexico's tropical coastline known as Costa Banderas. This amazing villa is located inside the private gated community known as El Farallon (The Cliffs). El Farallon is the first of Costa Banderas' private residential communities. Casa Aguas Vivas--House of Living Waters--was built to blend into the environment which surrounds the home. The building, which is appropriate to the climate and made from material indigenous to the area, is a statement of individuality. 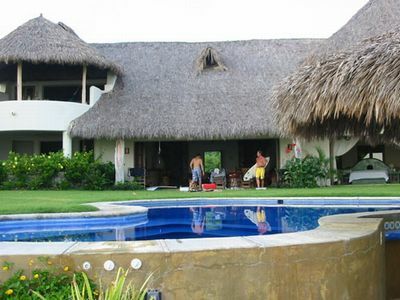 The palapa roofs and river stone mesh with the ocean, palms, and pools to create a romantic and unique home. The curvilinear architecture and stairways defy straight walls and convention, as does the indoor/outdoor dining room and bar area under a palapa umbrella. 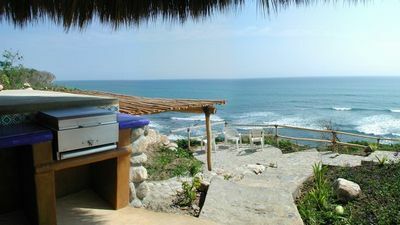 A cobblestone stairway from the palapa bar to the ocean, places you onto a mile of sugar-fine sand to the south. The architect, William Swanson from Santa Barbara, California, has incorporated function and form while allowing the building site and views to speak for themselves. The 2-story home has 3 bedroom suites, all of which take advantage of the spectacular vistas in all directions. To the east, from the upstairs master bedroom, the sunrise pours in from Puerto Vallarta across the tops of the trees in the tropical forest. The distant view to the south is the southernmost tip of Bahia Banderas known as Cabo Corientes, while in the immediate foreground there is a magnificent view of surf and coral reefs from 50 feet above sea level. 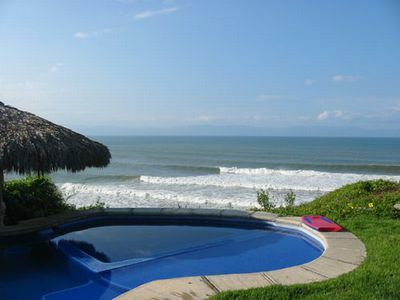 The view to the west encompasses the remainder of the Bahia Banderas, and sunsets that fade behind the Mariettas Islands. 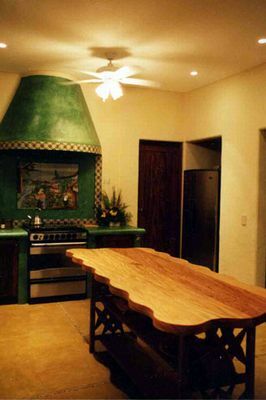 Native parota hardwood was cut from the jungle, dried and milled by local craftsmen to form the windows, doors, and some of the furnishings inside the home. The dark hardwood richly accents the openings with hand-crafted quality. The palapa roof, built by the same craftsman who built the main lobby of the Four Seasons, also displays the local talent as each palm frond is tightly woven together. This natural roof covering is impervious to rain, while allowing airflow that gives the architecture its place amongst the surrounding palms. Master Suite #1 — (downstairs) ocean view, private outside tub, patio, walk-in closet, twin showers, air conditioning in bedroom and bath, and private garden patio. Master Suite #2 — (upstairs) ocean and city light view, huge open palapa and covered patio, large outside shower, small office/child's bedroom, double hand painted sinks, air conditioning. 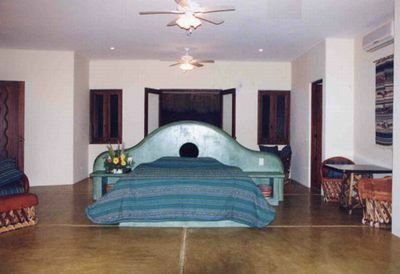 Master Suite #3 — (upstairs) ocean view, palapa roof, double hand painted basins, shower and outside private patio area, hand crafted parota beds, air conditioning. 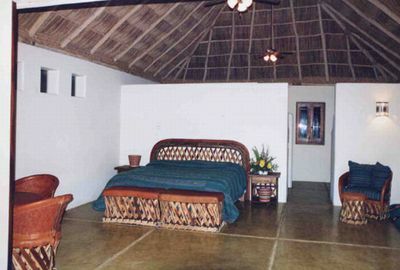 Great Room — Huge entertainment room, 27 foot palapa ceiling, stone inlaid floors, wet bar. Dining Area — Circular domed room with dining set for 10. Outside area opens to kitchen for service pass through. Kitchen — A stainless steel six burner oven/stove combo, stainless refrigerator and ice maker, prima vera hardwood center island and large walk-in pantry. Laundry Room — Built-in laundry sink and ironing/folding area. Separate bathroom and wash basin. Central Lap Pool — With stone/palapa changing room and bathroom, waterfall. Fully tiled in light blue. Pool/Palapa Bar — Dark blue tile with swim-up seating to wet bar, refrigerator, and BBQ grill. Large Jacuzzi and children's wading area. Adjacent changing area and bathroom with outside freshwater shower. 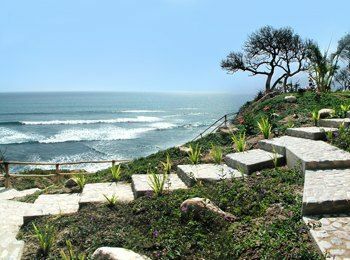 Stairway to Beach — Access to one mile of beach to the south. Cobblestone stairs to a mile of glistening sand and crystal clear water. The lazy beach is great for young kids and the outer surf break is home to excellent surf (in season).